Despite a forecast for potentially heavy afternoon thunderstorms, I decided to take Tuesday to ride my bike around Lake Tahoe. I had done this once before more than 20yrs earlier and have wanted for years to do so again - if for no other reason than to help in my denial at getting old. I was in Stateline, NV for a family reunion on my mother's side of the family but I would be doing this one solo - most of the family thought I was a little nuts. I got an early start around 6a in order to minimize the chances of getting caught in the rain but as it turned out the thunderstorms would never really materialize over the area. The distance around the lake is 72mi, plus some extra mileage getting to the lake and back to where I stayed plus a few stops for extraneous hiking along the way. The riding time was almost exactly six hour broken up into even segments. From Stateline to Incline Village up the east side of the lake was two hours. The stretch north on SR28 was the most harrowing part of the ride as the shoulders are narrow or non-existent and the traffic on this 55mph stretch seemed particularly in a hurry despite the early morning hour. On a downhill section, a cement truck came up just behind me before blaring its horn, seemingly just for the purpose of inducing a heart attack. Before reaching Incline Village, I stopped briefly to check out Sand Harbor State Park, not yet open to vehicles that were already lining up outside. From Incline Village to Tahoe City around the north side of the lake took another hour. Though shoulders were no wider, slower speed limits made this less scary on the bike. South of Tahoe City there is a convenient bike path that goes for miles to Tahoma on the west side of the lake. Yay for bike paths! Just past the Truckee River I stopped for a second breakfast in Tahoe City at a popular bakery/coffee shop. As I was continuing south on the bike path I came across Eagle Rock and paused here. 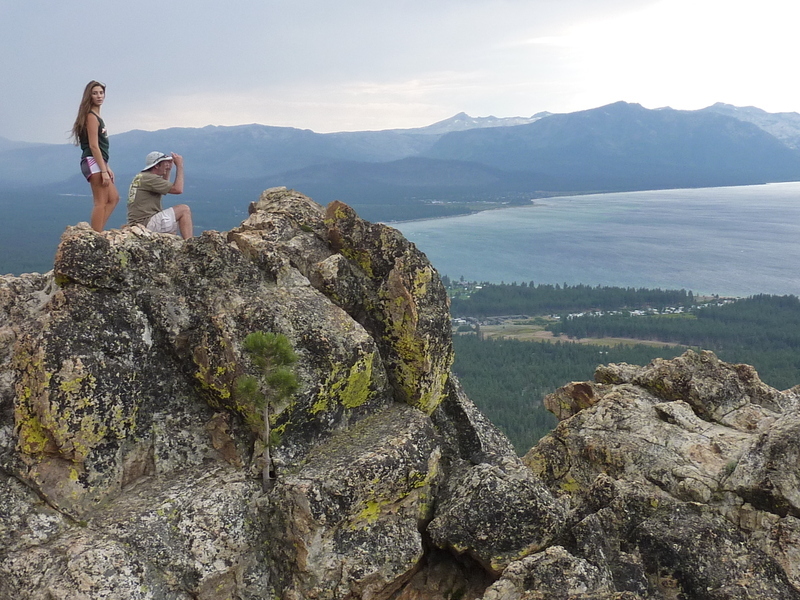 Eagle Rock is located on the west side of the lake overlooking the town of Tahoe Pines. I had been to the area in April of 2009 for a snowshoe outing to the peaks north and south of Blackwood Creek. Eagle Rock, located near the outlet of Blackwood Creek near the lake was to be the last stop on the long tour, but I was too tired and the route looked too brushy to bother with that day. Today, as I was approaching from the north on SR89, I saw people at the summit and guessed there must be a trail I didn't know about. I stopped at a small map posted along the roadway, one of two trailheads that can be used to hike up Eagle Rock. I locked the bike to the sign and started up on foot, an easy trail of less than a mile, climbing just over 200ft. The summit is rocky and open to views across the west side of the lake and up Blackwood Canyon. There were several parties at the summit overlook and I met several more heading up as I was heading back down - it certainly seems a popular destination. The whole diversion took about 30min and I was soon back on the bike heading south. At Emerald Bay I met up with about 30 of the family members that had driven out from Stateline to do the short hike down to the beach on the bay at Vikingsholm. My timing was rather fortuitous as I didn't arrange this ahead of time. I knew they planned to be there around 11a and it worked out well as we were both late getting there. Vikingsholm is the name of the mansion/castle built by a wealthy woman in 1929. The property changed hands several times before becoming part of a state park. There is a dock and beach at the site that are very popular in the summer. Tours of the home are available at $10/head, but I declined to join some of the others for this - gawking at over-the-top furnishings in over-the-top homes has never had any appeal for me. I left the others down near the beach around 12:45p. Clouds were starting to develop and it seemed prudent to get myself back to Stateline. It took another hour to make my way back to the house by 2p. Later that same afternoon my brother-in-law, a niece and nephew joined me for a short outing to Castle Rock. Located a short distance north of Kingsbury Grade and not far from where we were staying, this proved to be a nice little gem. There are several routes that can be used to reach the rocky outcrop and we explored both. Starting from the Rim to Rim TH off Benjamin Dr, the hike is about 2mi and well-signed until one approaches the base of the feature where the trail begins to fray into a series of climber trails on the east side. There are rock-climbing routes found at various points around the summit, but the route we were after was the easier class 4 route to the highpoint. The main trail circles around the north side before ending on the west side where a steep, class 2 slope is found leading to the small saddle between the highpoint and the lower SW summit. The class 4 section is about 25ft in height and not all that difficult. One stretch of about 10ft is weak on holds and makes for the hardest part, the remainder above this loaded with big juggy holds to make things easy despite the added exposure. Tom and Marisa were content to reach the SW summit which offers a commanding view from a small perch. The sky was overcast and threatening to rain, making for a very picturesque sky overlooking the lake below. It was very pleasant in the cool of the afternoon after days of 90F temperatures. Ben came over to the base of the higher summit to have a look but declined to give it a go. He might have been successful if I had given him a spot from below, but this seemed an ideal rock route for beginners and I suggested we should come back with a rope. Two days later we would be back with a much larger group. We took the shorter, southern route on the way back, only about a mile and a quarter. Two easy summits and some 75mi on the bike - a good day, indeed!